Workout Finishing Moves: Chest 21s For A Monster Pump! You'll never look at cable crossovers the same way again after trying this 3-part, 21-rep chest workout finishing move. End your next session with a monster pump! It's time to stretch a few of those new T-shirts you just unwrapped over the holidays! Finishing your chest workout with a single-joint move—be it a dumbbell fly, cable crossovers, or the pec deck machine—is a by-the-textbook way to flush your pecs with blood for a growth-inducing pump before calling it quits. After all, your multijoint bench presses from various angles are the best mass-builders, so single-joint movements should be left for the end of your workout. You can finish off your chest with dumbbells, machines, or cables, but one benefit cables offer is how easily you can change the angle of pull, forcing your pecs to work at novel angles. When you combine a cable movement with a triset technique similar to 21s for biceps, you'll discover a rather unique finishing move that'll pump your pecs to new levels—and hopefully stretch a few of those new T-shirts you just unwrapped over the holidays! Being a front-line writer and editor in this industry for nearly two decades, I've come across a number of amateur and pro bodybuilders who are oftentimes eager to share new ideas with me. (I'm likewise eager to share them with you, though I can't take credit here for their origination.) Here's one I learned from three-time Mr. Puerto Rico Mauricio Solis at a photo shoot. By adjusting the height of the pulleys, you can alter the line of pull. With the pulleys in the top position, the emphasis shifts toward the lower pecs; when the pulleys are in the bottom position, the focus is on the upper pecs. There are a number of middle positions on adjustable cables that can also be used to slightly alter the line of pull and the target area. You can also change the point of emphasis on your pecs by adjusting where you bring your hands together in front of your torso. In general, when you bring them together lower in front of your body, you target the lower pecs to a greater degree, and when you bring your hands higher you shift the emphasis to the middle or upper pecs. By adjusting the pulley height and determining where you want to bring your hands together, you can nicely isolate most areas of the pecs, but it's a bit difficult to hit the middle pecs dead on—that is, unless you take a few big steps forward so that you're no longer in line with the two pulleys. This changes the angle of pull once again. Though you can focus on the lower or upper pecs in this scenario too, it's here that you best target the middle pecs with a favorable body position relative to the pulleys. In sum, cables allow you to hit the chest musculature from different angles in very different ways than you can with, say, the pec deck machine. Here's how we can use the cable crossover's unique advantages to create a monster finishing move that'll hit your pecs with a single-joint move from all new directions. When doing fly or cable crossover movements, it's imperative that you lock a slight bend in your elbows to isolate the pecs. If you start with a 90-degree bend in your elbows and your arms are fully extended at the end of the range of motion, you'll turn a single-joint move into a press, defeating the purpose. The degree of bend in your elbows must be the same at the bottom of the move as it is at the top. 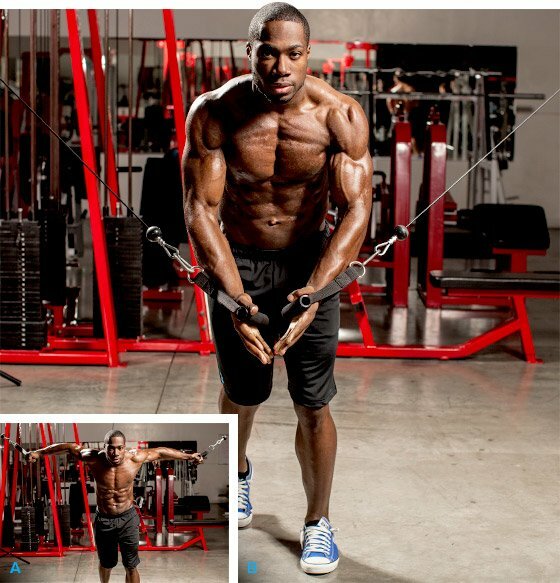 This triset consists of doing seven reps apiece with three different angles for a total of 21 reps. Choose a weight than you can do for about eight reps. You won't change the weights or the pulley positions between sets, just your body position (which affects the angle of pull). This keeps rest time between segments to a minimum. The high-rep total will drive blood into your pecs, allowing you to finish your chest workout with a superior muscle-building pump. With the pulleys in the top position with D-handles attached, grasp the handles and stand midway between the cable stacks. Bend over completely, keeping your back flat and knees unlocked. Your upper body should be almost parallel to the floor. Lock a slight bend in your elbows and complete seven reps, bringing the handles directly down toward your feet. Try to avoid rising up as you complete the move. Similar to a pec deck machine, this targets the middle pecs. After you complete those seven reps, do a more traditional cable crossover in which you're standing slightly bent over in a split stance with your arms out to your sides and your knees soft. Bring your hands together in front of your lower abs, which more effectively works the lower region of the pecs. Do seven reps. If you're struggling, a little—little!—body English can help you keep the weight moving. Now, take two big steps forward. You're going to change the angle of pull by bringing your hands both forward and just slightly down, working the pecs between the lower and middle regions. (Note: If the cables are short, you might "top out" before reaching full extension, in which case you'll have to back up a bit.) Do seven reps to fully fatigue and fill your chest with blood. Because you're using a split stance, you can step forward a bit on each rep to generate momentum and help you get over any sticking points. This is just one example of three different variations of crossovers you can combine in a triset. You can easily come up with others, so feel free to experiment with pulley placement, finish position, and body position in front of the midline of the cable apparatus to change the angles of pull and areas of emphasis. Moreover, don't restrict yourself to traditional rep ranges. Try pairing multiple angles and rep ranges into supersets or trisets, or even do dropsets. You can not only juice up your training for a monster pump, but add some much-needed variety to challenge your mind and body. Dips may not seem like a brutal way to finish off your chest workout, but when done with negatives, you'll find that slowing down each rep can speed up your gains.